What is a smart poster ? A smart poster is a poster which has built in technology allowing a reader to interact with it using a smart phone. In general terms, the technology could be a QR Code, BLE (Bluetooth Low Energy), NFC or something else. However, because this is NFC.Today, this article will focus on creating an NFC enabled smart poster. The most significant reason to make your poster smart is to allow a user to instantly and easily get access to more information. For example, if the poster is advertising an event such as a music concert, then the ‘smart’ interaction can allow mobile users to get schedules, directions to the event or book tickets. Nobody likes typing a web address into a mobile browser and doing a search might not pull up the right results. A quick scan of an NFC tag built into a smart poster and they are where they need to be. For the chip, there’s plenty of discussion on the rest of NFC.Today about other chips but let’s keep it simple, go for an NTAG213. For the size, you want large – something in the region of 35mm to 40mm. There are larger tags but they don’t always perform better. 35mm to 40mm is a good size. Lastly, you want a quality tag. A poorly made tag might have the right chip and the right size but if it’s badly tuned then the scan distance will be low. How much will it cost to make a smart poster ? If you already have a website then it will cost very little. You print your posters as normal and add some artwork to the front to show users and encourage users to interact with their phone. Then you buy some NFC tags from a reliable NFC tag supplier such as our site sponsor, Seritag. A small batch of tags will cost you 40 pence / 50 cents per tag with encoding to link to your website. You then simply attach them to the back. Done. You have created a smart poster for well under a pound/dollar per poster. You have two options. On the front, or on the back. If you put them on the front, then you probably need to do one of two things. Either get the NFC tags made up with special graphics so they look good. This will cost a fortune and add delays and hassle. Or, make life easy and get thin, plain NFC tags and get some normal stickers made to put over the top. Then, put the NFC tag on the front and the cheap normal sticker over the top. Just make sure you don’t use any fancy metallic ink effects on your over sticker. This is best way to do things if you want to add NFC to posters that are already made or are already in place. If you put them on the back, then just add a ‘call to action’ on the front and place the NFC tag on the back of the poster directly behind it. Quick and easy. NFC tags will scan through the paper (or plastic) of the poster and can be scanned from the front. This way, the front of your poster will look clean and neat but be smart and clever. Normal NFC tags do not work directly on metal surfaces. There are special on-metal NFC tags but you need to be careful using them as they have a back and a front. If you stick an on-metal tag onto the back of your poster as described above, then the special ferrite barrier material will be facing forward and it will block people from scanning. There are four solutions. The first, easiest and the one NFC.Today would recommend is to use a normal NFC tag but to create a gap. Ideally, you need a 5-10mm+ gap between the tag and the metal. Attaching a bit of foam behind the tag to push the poster away from the metal is an easy and cheap way to do this. The second option is to use a on-metal NFC tag and attach it back to front using glue/tape rather than the adhesive that comes with the on-metal tag. You need the black ferrite barrier material facing the metal and the white face of the tag facing the front of the poster. The third way is to stick the on-metal tag on the front of the poster which will not look good. The fourth is to use a special ‘reverse’ on-metal tag which will cost a fortune and have a shocking performance. For smart posters to work effectively, you need to make sure the NFC tags can be scanned quickly and easily. You need the best scan distance possible. On-metal tags have a very low scan distance and as such, NFC.Today strongly recommend not using on-metal tags on smart posters unless you really have no other choice. Let’s be clear. Not many people like to stand in front of a poster waving their mobile phone. Therefore, consider where the poster is and where the user will be when the scan it. Obviously, you don’t want to hide your poster – that wouldn’t make much sense. However, if you are adding a poster to a notice board then placing it towards the ends or lower down might encourage more people to interact. You can’t increase the scan distance of an NFC tag. However, NFC phone have a ‘hot spot’. This is an area on the back of the phone that responds the best to an NFC tag. On most modern smart phones which are quite big, the hot spot can be relatively small. Therefore, some users will wave the phone around trying to scan the tag. This isn’t always a very good user experience. So, while you cannot increase the scan distance of NFC tags you can increase the active area by using more tags. This means that the user doesn’t need to be so accurate in placing their phone and the result is that the poster feels more ‘responsive’. To do this, you can create an array of tags placed next to each other in a triangle or even bigger. The tags can be right next to each other but make sure they are not overlapping each other. This is everything. The call to action is the text or graphics that you put on the front of the poster to encourage people to interact. And this is where so many people get things wrong. NFC.Today are going to put together some information on this shortly but for the moment, let’s keep it simple. You need three things. First, an NFC logo or image of some kind. The easiest way is to use the official NFC Forum N-Mark logo. Use a logo with the letters ‘NFC’. The second item on your call to action should be a picture of a mobile phone. You need this. Without a phone, your response rates will fall off a cliff. Then finally, you need to add a small amount of text. NFC.Today recommend something like ‘Touch your NFC enabled phone here for more information.’. With these three elements, you have told the user exactly what to do and why. It’s that simple. The easiest way to get started is to link your smart poster directly through to your website. However, the next stage is usually to try and understand how many people responded and why. NFC.Today are going to put some information on this in the future. However, two quick suggestions. First is to use Google Analytics on your website and encode the tracking URL directly into your tags. 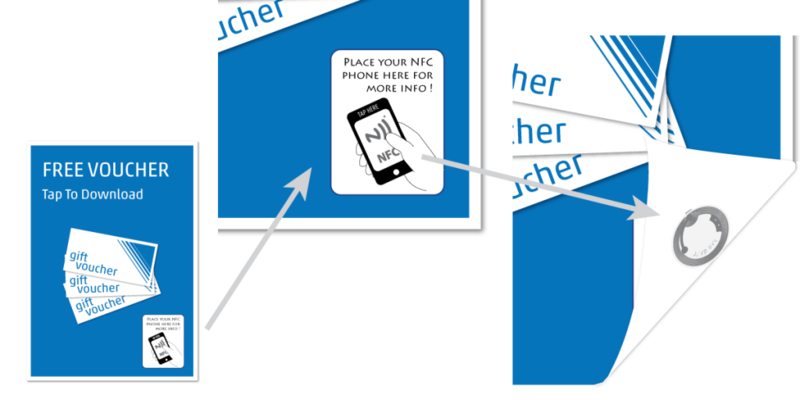 Your NFC tag supplier might be able to encode each tag with a unique link and then by placing a unique tag onto each poster you can tell which poster was scanned. The second option is to simply use something like bit.ly or goo.gl to track basic click counts. Redirect through to your website and encode the link onto your tags. If you encode a link onto your tags (or get them encoded by your supplier) and you put the tags in a public space, then lock the tags. If you don’t, then anyone can change the link and redirect all your smart poster visits somewhere else.